Interns are the students who are on the first step of their learning process. If you will not be in order, then you won’t be able to make them learn effectively. Making a plan means to create a timetable that you will be following for the interns. You should provide interns with the weekly projects to accomplish. Those projects should be good enough to make them learn all the technicalities that goes within the work culture. You should give them the clear goals to achieve according to the benchmarks set by the company. Every intern should have a supervisor so as to keep the track of the work they do. If they will not have any manager or supervisor over them, they certainly can take the things for granted due to the little casual attitude like that of school or college students. So, give each one a supervisor. Also the supervisor will tell them their mistakes and it will be good for interns. Every intern should be given a dedicated project to fulfil in their whole internship period. That project should be given with a proper deadline so that no delay could be seen in the matter of work accomplished. The interns should be provided with a satisfied and reliable project and should be supervised side by side. Transparency will prove the credibility and the reliability of the project given. Every day project should be provided with complete transparency in terms of the company’s initiatives. Many companies hold back the same projects and share the similarity with the interns. This should not be there. You should provide the same level of transparency as those given to the employees. This way interns learn in a better manner which is good for the interns. Small breaks should be in the form of coffee breaks. The interns should be treated well and should not be exploited. Make sure you treat interns respectfully and with full care, only then they will feel the warmth in their working atmosphere and they will learn the best. The simple task to manage the interns is to meet for casual 30 minutes coffee and then you could discuss the projects, the issues the interns are facing and other problems too. The assignments that you provide the interns should be broken into smaller parts so that the interns do not feel the burden of the work altogether. Also, when the assignments are given, make sure those are reviewed on a daily basis or the interns may fail to give their best in the work provided to them. The interns should be made clear to the company’s prospective, it’s goals and everything. You should share the whole bigger picture of the company and it’s projects and how the projects help in bridging the knowledge gap. Before the interns join the company, let them be aware of the company’s prospective and what is expected from the interns by the company. The interns are new to the work as they usually come from the school or the college background so it is essential to encourage your interns regarding the professional work culture. You should also encourage the interns to ask a number of queries. If you will allow them to ask questions, they will be able to learn the things more effectively. Whatever you are making the interns do, should also be known to the company, if they are learning it well or no. It could be done only by the way of feedback. You should get the feedback from the employees in the way of test or verbal conversation. It will help you to know whether the training provided to interns went well or not. Do not burden the interns. Make them learn slowly. If you will give them the burden all together, they may fail to know the things in the deep. Do not run a rat race. Move ahead with simple steps and also make sure you do not jump directly to the last step. Move gradually and this will also do the work for you as well as for your interns very easily. Make the process of learning for the interns very simple and straight forward. Do not let the interns crib inside if they do not understand anything. You should be open enough with them to understand the matter firmly. Make the steps very simple for them to know. The interns should be treated equally like the employees. After all, the interns showcase the real picture of your company to the outside world. So you should treat them well so that a good picture is presented in front of the public and also the competitors. The type of projects you give to the employees should be the same as those of the interns. This will not only help you know the real potential of the employees, but also you will be able to hire the best interns as your future employees of the company. To know whether the interns are learning according to you, you must take their test. 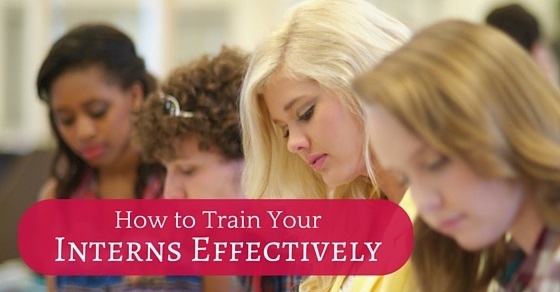 This is the best ways to train the interns more effectively. If interns will have to give the feedback, they will learn in a better manner and even you will be able to satisfy yourself by giving the best knowledge during the internship period. You should keep your interns connected with the projects ongoing. The interns should not feel left out instead should be given a good treatment. You can keep them interested by involving them in all the small events that take place in a company. If not this, you can even ask them to give a little hand in the other projects than those provided during the internship. The interns can be little bit bribed by the way of incentives. If you inform the interns about the incentives being given, you will be able to provide them the best training as they will also show the most of interest in the learning process. The incentives are not always in the terms of money, but in other ways like inviting the interns in the workshops organized in the company. The field work, if any, or if there is any function, you can ask them to join the event. So, provide them with the incentives. The interns should be given the homework so that they get to learn more effectively and also they could remember for long what they practice as intern in the office. By giving homework, you will be able to give them a better understanding of the task they complete in the office. Not only the practical training has enough but also make them trained about the writing too. They should be an expert at writing as well as the practical thing. Writing will improve their written skills and this is how you will be able to make them learn in an effective manner. Do not be harsh with the interns. Be polite and also very friendly. If you will create a friendly atmosphere with the friends, you will be able to make them learn the best out of your company that too in an effective manner. Behave in a friendly manner. Listen to their problem and also address them effectively and immediately. Make them feel comfortable, only then they will be able to put full focus on the work they do. So, above are the points that must be kept in mind while making the interns learn the things in a better and simpler manner. Interns should be treated well and should not be treated as left out of the company. Employees are the permanent part of the company and in the similar manner the interns also are a part of the company. So, treat them well, make them learn everything minutely so that they can bring success to the company and also to their career.